FINDING: In all groceries and in farmers markets. CHOOSING: Though tomatoes are available year-round in all groceries, they are rarely full of flavor unless you’re buying tomatoes that have been ripened on the vine. True vine-ripe tomatoes are difficult to ship far distances, so they will typically be grown nearby or be very expensive. Plum tomatoes are meatier than round tomatoes and produce thicker cooked sauces. Round tomatoes are juicier than plum tomatoes and produce more appealing salsas. Ripeness is more important than variety, however, since plum and round tomatoes can be interchanged in recipes. STORING: At room temperature until thoroughly ripe. 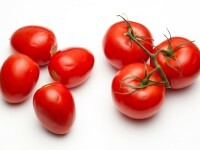 If you cannot use tomatoes once they are ripe, they may be refrigerated, though cold dulls their flavor. In the refrigerator, a ripe tomato will hold for a week; because of textural changes, refrigerated tomatoes are best cooked.